Most years at this time, I dwell on the epic medieval poem of Sir Gawain and the Green Knight. It’s an appropriate one for journeyers through our countryside as Gawain makes a winter journey to keep a date with destiny with the green knight. It’s very much a story of the Staffordshire moorlands, for the story comes to a climax in the great fallen cavern of Ludchurch. The poem is wonderfully descriptive of wild countryside and a terrific adventure. One for every walker who loves the challenge of the great outdoors. I was born in Staffordshire, though the other end. But from childhood I knew those north Stafforshire moorlands very well. Re-reading the poem is a joy to me. If you love the writings of Alan Garner, Tolkien, Pratchett et al, it will resonate with you. A good translation is by the poet and Oxford don Bernard O’Donoghue (Penguin 2006). This translation concentrates on the tale itself and the rhythm of the original, veering away from the alliteration and half lines of the original. I think O’Donoghue captures the spirit of the poem well. As a variant, you might like to try the version by the poet Simon Armitage, who brings the local links very much to life. Ideally, you should try both, but if your Middle English is holding up do try the original. John Bainbridge has walked in the Devon countryside for over fifty years, and is well known as a writer and broadcaster on the county. In this miscellany of country essays, he explores many of the quiet corners of Devon, from the wild moorlands of Dartmoor and Exmoor to its spectacular coastline and peaceful pastoral landscapes. John Bainbridge is the author of the country books The Compleat Trespasser and Wayfarer’s Dole. This is no definitive account of Devon, nor yet a walks guide, though there are snippets of history, legend and topography in the pages which follow. Footloose in Devon is rather a bedside book, a volume to be dipped into when the reader has a quiet moment. I hope the places mentioned might inspire some rambles and expeditions into the heart of this very lovely county. ‘The Holly House Mystery’ is currently on sale for 99 pence/cents on Amazon Kindle in the UK and USA. Set in 1931, our second Christmas crime novella is an affectionate homage to the country house-party whodunits of the Golden Age. It’s also available in paperback. BALMORAL KILL ON KINDLE – ONLY 99 PENCE/CENTS THIS WEEK – and you don’t need a Kindle. Just download the free app for your laptop, tablet or phone via the link at the foot of this blog. Balmoral Kill is also out in paperback if you are looking for a Christmas stocking filler or just for a book to read over the Christmas holiday. 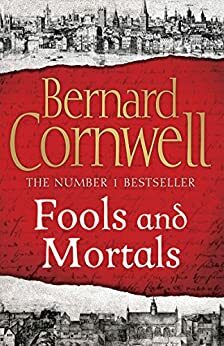 Bernard Cornwell’s novel Fools and Mortals is a triumph of historical writing, proving that you don’t need battles and epic events to produce a fine historical novel. Bernard Cornwell’s take on late Elizabethan London and the world of the Shakespearean playhouse is superbly realised. He portrays so vividly the violent and stinking society whose predilection for entertainment in the form of plays led to the greatest of our literature. I’ve been a fan of Bernard Cornwell for many years, right from the first Sharpe novels. I think the stories of the Alfredian warrior Uhtred give us much of the best historical writing I’ve seen in recent years. So I was intrigued at this new departure into the world of Shakespeare and his plays. There are no battles in this one, though there are one or two fights. But there is a great feeling of menace as the hero, William Shakespeare’s brother Richard, falls foul of various elements of the Elizabethan Establishment in his desire to abandon playing women’s parts and seeking out male leads. Much of the novel is set against the first staging of A Midsummer Night’s Dream, and Bernard Cornwell does a masterly job of interpreting just how plays would have been staged in the 1590s. He has a great gift for transporting you right into period, you feel you are there. This is a writer at the height of his powers. Re-creating the past fictionally isn’t easy, as I know from my own experience. Bernard Cornwell makes it seems effortless, a sure sign that he’s taken a great many pains to get it just right. His actors are wonderfully portrayed, as bitchy and self-seeking as any acting company down the years. I particularly loved his portrayal of the great extrovert clown and jig-master Will Kemp. I’ve always had an interest in Kemp myself and he comes alive again in the pages of Fools and Mortals. I also liked the tension between Richard Shakespeare and his famous brother. I suspect Will Shakespeare was rather like this portrayal, ambitious, impatient, not tolerating fools easily. I’ve always been an ardent Shakesperean. I became aware of my father’s copy of the collected plays as soon as I could read – my father took Shakespeare with him when he took part in the Normandy Invasion in 1944. I read the plays first when I was quite a small child. I went to a sensible state school in the Midlands where we were taken to see the plays performed at Stratford and at the Birmingham Rep. Reading and watching Shakespeare has remained a delight to me ever since. I remember being taken to Stratford in 1964 to see the celebrations for the 400th anniversary of Shakespeare’s birth, when a representation of the poet’s London and his stage were recreated – this in the days before we had the Globe Theatre. But even if you are not a fan of Shakespeare this is a novel to seek out. Mr Cornwell has created a world to lose yourself in.